Thermostatically controlled, high velocity air circulates throughout the tunnel to wipe away wrinkles as heat relaxes the fabric and removes moisture. 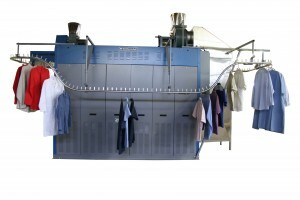 Air deflectors direct a vigorous airflow over the garments for outstanding finished quality and a soft, lint-free feel. Available with either gas-heated or steam-heated finishing chamber in three different models to meet your specific production requirements.